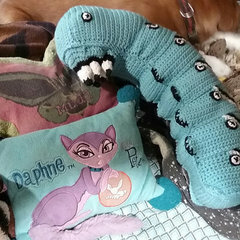 What's the most unusual item you've ever crocheted? For me, it's chicken sweaters! I made these two chicken sweaters for a hen rescue in the UK. Sorry, I don't have a picture of them on the chickens. Well that is unusual. They are cute. When I read the title, I thought I'd see chicken images on a sweater. Instead, it's sweaters for chickens! Just when I'd thought I'd seen everything. LOL Great job on them!! My most unusual item is a pretty standard one ... tooth fairy pillow. That kind of goes in the same category as the outdoor propane pizza oven I saw the other day--now I've seen everything! Great job! Well, I don't even know if I can put this on here! Let's see, how could I say it in a nice way....it's a gag gift that has no real purpose, and I have no picture of it. It's called a "p*t*r warmer"! Use your imagination! My husband's aunt made one 35 years or so ago for a fellow factory worker! Many years ago when my children were small, we had a faerie garden in the backyard and they asked me to crochet winter sweaters for them. So I did. 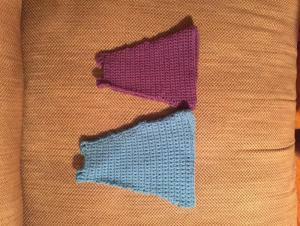 I made them about 2 inches long. I made little hangers too hanging them next to the faerie's cottage in the tree stump. After hanging there for 2 days, they were so surprised and convinced the faeries found them. I kept them for years then hung them on the Christmas tree when they were older teens. They loved it!